Today we are going to review a wine, whose previous edition impressed us so much, that we’ve decided to try out it’s successor – Principele Radu Merlot Anul III 2012 from Tohani. This is a single varietal 100% merlot wine, which was vinified in a pure Bordeaux style, made with overripe grapes and moderate use french barrique, where preservation of varietal aromatics and local terror was the main ideology of the whole winemaking process. 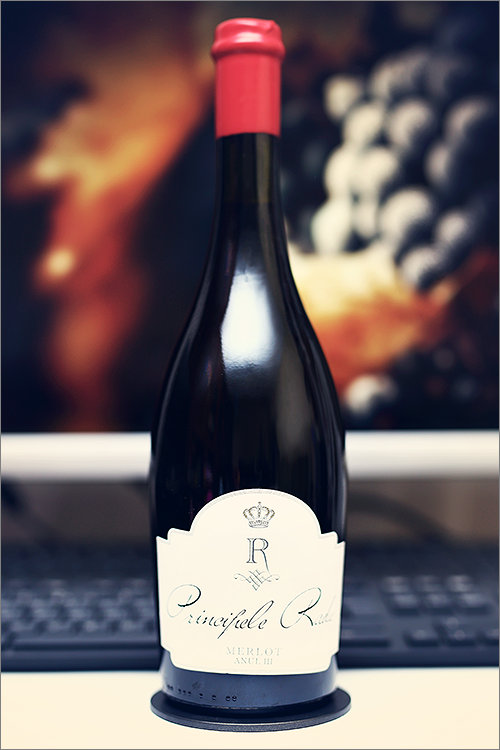 This particular wine was created specifically for the Royal House of Romania as a form of homage, intended to express excellence and tradition. That being said, let’s get straight to the tasting and find out how good this wine really is! Very deep and noble garnet color, with opaque ruby hues towards the rim of the glass. The nose is strong, filled mostly with ripe black fruits: black plum, black cherry, blackberry, black mulberry, black raspberry, dried red cherry, dried cranberry, overripe sour cherry, wildberry, wild cherry, roasted oakwood, nutmeg, cherry tree wood and cherry seeds. An instant later the nose is filled with elegant notes of leather, dried cherry tomato, anise, red and black pepper and some nuanced hints of danish blue cheese. The wine is extra-dry, with high alcohol level, high acidity and firm tannin. It feels bold, ripe and tannic, with a nuanced fruit-forward accent. This is a seedy, complex and quite elegant wine, which has a nuanced old-world style all over it. The wine has a good overall balance and it feels quite extracted, velvety and a bit oaky. It has a long finish and a quite velvety, bitter-seedy aftertaste. This is definitely a great Wine of Romania and the overall rating says the same, with 91.9 points scored it is right there, among the best wines we’ve tasted so far. Please click on the chart icon on the left in order to get to the wine rating page, where you can find all the wines we’ve tasted to date. Conclusion: this is a wine that is about to reach the summit of its prime form – firm, noble and seedy, with a nuanced fruity accent and quite grippy tannins. It has a great ageing potential, as it can resist up to 5 more years of bottle ageing. This is a fine example of an exceptional quality merlot wine – the style that makes merlot great again on the mappemonde, despite its reputation as the underdog to cabernet sauvignon. The only thing that confuses us is the wine’s new-world accent – a wine that was concepted vinified with an old-world mindset ends up as a ripe, extracted and fruit-forward wine. For the best experience, we would recommend to pair this wine with sweet-sauce-based dishes, like for example a pan-seared filet mignon with red wine and balsamic sauce or a bacon wrapped filet mignon with blue cheese and cherry sauce. Hai, Noroc!